With a few weeks left before winter begins to settle in, many gardeners are taking final passes at their lawns and gardens. No reason the yard shouldn’t shine right up until the first snowfall, right? When you’re a pet owner and animal lover, though, there are several things to keep in mind to help keep pets safe as you go about your gardening and lawn care this fall. You’ve seen your dog go crazy barking and chasing leaves when a gust of wind comes through, so maybe you think it would be even more fun to create that gust of wind yourself by blowing leaves at him with your leaf blower. But don’t do it! Some leaf blowers can blow leaves — and whatever other debris might be hiding within those festive piles — at speeds of up to 200 miles per hour, which means that objects caught within the gusts could hit your pup with considerable force. When it comes to choosing which chemicals to use on your lawn and garden, it’s important to note which are pet safe (and which are likely to attract a curious dog or cat). For example, dogs often love to eat fertilizers — the organic ones in particular. Fertilizers typically have a low degree of toxicity, but if you suspect your pet ate fertilizer, call your veterinarian. Wild mushrooms can be poisonous to cats and dogs. Be on the lookout for any growing in your mulch. Since there’s a time to reap and a time to sow, you might not be planting too many flowers this time of year. However, if you’re covering your flower beds with mulch, avoid cocoa mulch, which has a sweet smell and contains caffeine and theobromine (the same substances that make chocolate dangerous to pets). 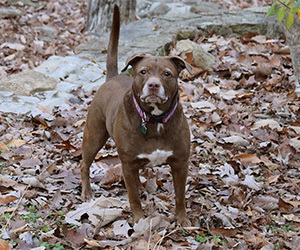 Pets who ingest cocoa mulch can display the same signs as they do after consuming chocolate — vomiting, diarrhea and even muscle tremors and neurologic signs. When possible, take advantage of other, safer types of mulch. And if your pet ingests cocoa mulch, call your vet right away. With any mulch product, be mindful of mushrooms, which can grow in it and can be toxic to dogs and cats. For the lowdown on which mushrooms are most dangerous, check out our guide to wild mushrooms. Mushrooms aren’t the only toxic item that grows in the yard, of course, so if you’re considering planting a fall garden, read up first on which seasonal fruits and vegetables to avoid. Our article on common household poisons is a good start, but you can also refer to the ASPCA’s comprehensive database of plants that are and are not toxic to pets. And, remember, just because a product is organic or a plant is pretty, that doesn’t mean it’s safe for your pet.